Hostal Residencia Adelino is a just renovated Guesthouse in a 5 stories building, on the ground floor you can find the reception, the lounge where you can relax reading a book or just watch TV, reception, cafeteria and swimming pool. At Hostal Residencia Adelino you can enjoy a family atmosphere. All rooms have wifi, air-conditioning, private bathroom ,minibar, TV and some with balcony. The rooms can be triple, double or single. We also have a cafeteria, swimming pool and a lounge where you can watch TV, relax or read a book. 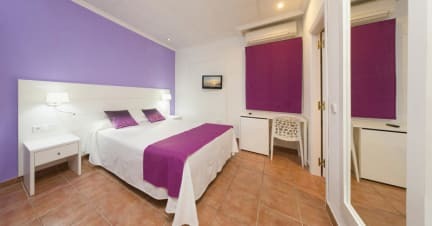 At 500 meters from the central bus station, 10 minute walk you will find the nightclub and Eden Esparadis located in the port of San Antonio, also can enjoy the beach in just 5 minutes walk. 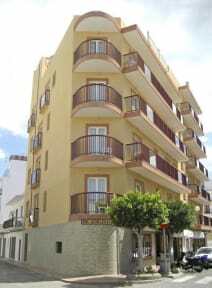 In the vicinity you can find supermarket, shops, hairdressers everything you need to spend a nice stay. Important information: Once you book we will charge you for the first night of accommodation as deposit, if you cancel on time we will refund that charge.